Design ideas for a transitional living room in Calgary with a stone fireplace surround, beige walls, medium hardwood floors, a wall-mounted tv and brown floor. Traditional bedroom in Denver with grey walls and carpet. This is an example of a traditional dining room in Chicago with beige walls, dark hardwood floors and brown floor. 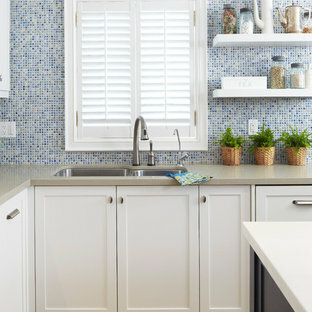 Contemporary kitchen in Toronto with mosaic tile splashback, blue splashback, white cabinets, recessed-panel cabinets, a double-bowl sink and quartz benchtops. This is an example of a mid-sized traditional formal open concept living room in Atlanta with a standard fireplace, a stone fireplace surround, beige walls, medium hardwood floors, no tv and brown floor. 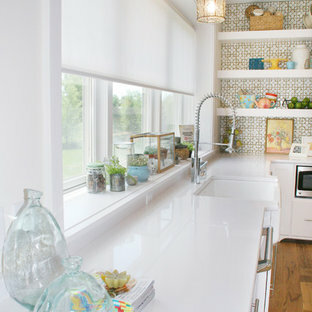 Photo of a traditional kitchen in Toronto with beige cabinets, stainless steel appliances, metallic splashback, metal splashback and glass-front cabinets. 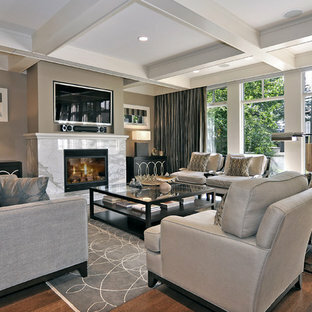 Jane Lockhart Interior Design, Kylemore Model Home "Dublin"
This is an example of a traditional enclosed living room in Toronto with a stone fireplace surround, a standard fireplace, a wall-mounted tv and brown floor. Design ideas for a traditional sunroom in Other with dark hardwood floors, a standard ceiling and brown floor. Inspiration for a traditional master bedroom in Portland with blue walls and carpet. Design ideas for a traditional bedroom in New York with green walls, a stone fireplace surround and a standard fireplace. Photo of a transitional guest bedroom in San Francisco with multi-coloured walls. This is an example of a mid-sized transitional formal living room in New York with grey walls, a standard fireplace, no tv, a stone fireplace surround and brown floor. Contemporary living room in San Francisco with a tile fireplace surround.